We can’t control when the wind blows, so wind farms sometimes generate more electricity than we can use. During the night, for example, when electricity demand is low, there may be wind energy available, but traditional coal and gas power stations are still kept running. This ensures they can ramp up quickly for the sharp rise in demand that happens at breakfast time every day, when people wake up, turn the lights on, and make themselves a morning coffee. With renewable energy making up an ever-increasing proportion of the UK’s electricity mix, National Grid often has to pay wind farms (and often hydro and conventional power stations as well) not to generate. These actions are expensive, and in the case of wind, a waste of free, renewable electricity. Flexitricity has been providing “headroom” to National Grid – extra energy from industrial users when there’s not enough coming from traditional power stations – since 2008. Footroom is the opposite: it’s used when renewable sources are producing more than the system can cope with. Just as we pioneered headroom services like STOR and frequency response, we’re doing the same with Footroom. Our approach is a lower-cost alternative to balancing supply and demand, allowing renewable electricity sources like wind turbines and solar PV to better integrate into the system. National Grid has now adopted Footroom under a service called Demand Turn-Up (DTU), with a draft service agreement released today. DTU will launch as a pilot this May, targeting the toughest periods in summer when both solar and wind generation can be high while demand is low. We are working hard with National Grid to make sure DTU works for the system and attracts maximum demand-side participation. We’re also continuing to develop Footroom for windy periods outside the summer. Industrial, commercial and public-sector sites can earn revenue from Footroom if they can either decrease generation or increase electricity consumption on request. They don’t have to be able to do that all the time, but the more they can, the more they will earn. For example, a Combined Heat and Power (CHP) generator could shut down for a short period, or a water pumping station could pump more at a time required by National Grid. More often than not, this requirement would increase in the summer months, especially overnight or at weekends. There’s just one proviso: Flexitricity won’t recruit deliberate waste into Footroom. Turning on the lights in an empty building isn’t the right way to balance renewable generation. Similarly, we don’t expect hydro generators to participate if they don’t have a reservoir to store the water for later use. So how would a Footroom or demand turn-up event actually work on site? Just as we do with other services like STOR, Flexitricity will install an outstation at the participating site, which will interface with the site’s control systems and send signals back to Flexitricity’s control centre in Edinburgh. When there is excess generation on the national electricity system, National Gird will issue a call to Flexitricity, and our system will send a signal to the outstation on site to reduce generation or increase demand. We’ll monitor site status 24 hours/day so that we can inform site staff of any problems, or prevent calls from being issued if core business would be affected. During a demand turn-up event – which will tend to last around two to four hours – CHP sites will normally keep the heat customers supplied using either a heat store or back-up boilers, and will import electricity from the grid. It’s this import which National Grid values, because turning off wind farms is expensive. The site makes a profit above the cost of keeping the heat customers supplied – but whenever that’s not the case, we can simply suspend the service. 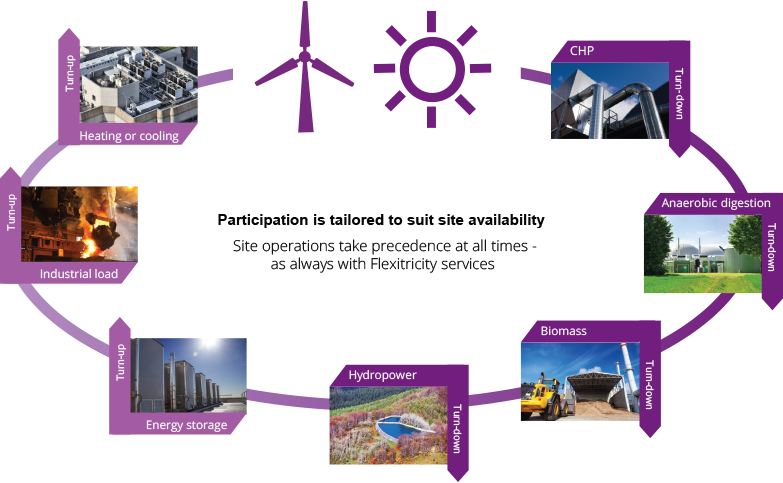 Energy-consuming sites can deliver by changing their consumption schedules or ramping up a process. For example, a water pumping station could run additional pumps during a demand turn-up event. The site would then have less water to pump later, so the pumping schedule for the rest of the day would be altered. Running more pumps might be less efficient, but as long as the losses are relatively small this method is an economic and environmentally sound way of balancing renewables. A cold store, on the other hand, could deliver demand turn-up simply by reducing the target temperature in the chambers. This will increase the consumption of the compressors, and build up a store of “coolth” in the frozen stock. When the requirement for demand increase is over, Flexitricity’s system automatically tells the site that it’s time to go back to normal behaviour. A CHP would start back up if the site required the heat, and a cold store would stop consuming electricity for a while as the temperature drifts back up to the usual level. So Footroom doesn’t require a radical overhaul of business consumption or generator patterns, and Flexitricity’s usual automated and manual protections make sure it doesn’t disrupt core business. With short-duration, low-impact changes to when a site consumes or generates, industrial and commercial energy users can earn revenue, help absorb renewable energy and make the national electricity system cheaper and greener.